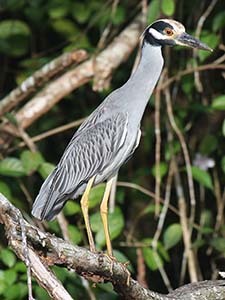 A landscape level approach was employed to determine the habitat requirements of breeding Yellow-crowned Night-heron, Nycticorax violaceus. Yellow-crowns utilize wetlands for foraging and uplands for nesting. The objective of this study was to quantify the influence of within-patch and landscape-level variables on foraging and nest site selection patterns. The study site was a thirty-five mile section of the Lafayette River in the lower Chesapeake Bay. The landscape was quantified using NAPP 1:40,000 color infrared photography and ERDAS, a GIS software program. Visual surveys were conducted to locate nest sites in upland areas and marshes were observed by boat to estimate Yellow-crown use. A discriminant function analysis was utilized to distinguish nest site characteristics and a multiple regression analysis was employed to determine variables influential on bird use. Univariate regressions and ANOVA were also employed. The results suggest that Yellow-crowned Night-herons rely on mixed forest patches of loblolly pine and several deciduous tree for nesting. Foraging areas are located close to nesting sites. The marshes used preferentially had long shorelines and minimal internal area. The preferred combination of suitable nesting and foraging habitat for breeding Yellow-crown Night-herons in tidal portions of the Chesapeake Bay is described and the results demonstrate the importance of analyzing an entire ecosystem when developing a management plan.